← Saving Wilted Lettuce With Ice Water Review – Does it Work? Summer is almost here, and is bringing with it all the glories of summer fruit! The fruit flies are also arriving: swarming in your kitchen after any bit of ripe fruit they sniff out. There are many tricks to get rid of fruit flies in your kitchen that involve chemicals or lot of hard work. Could making an all natural fruit fly trap get rid of the buggers instead? Saves Time – no time spent swatting flies, because they are already dead in your homemade trap! We are on the verge of summer here in Southern California and the summer fruit season is gearing up quickly. During the past couple weeks, local CSA boxes have been overflowing with yummy stone fruit: peaches, nectarines, apricots, etc. With fruit bowls full to overflowing with sweet, soft, perfectly ripened fruit, the fruit fly party has begun. 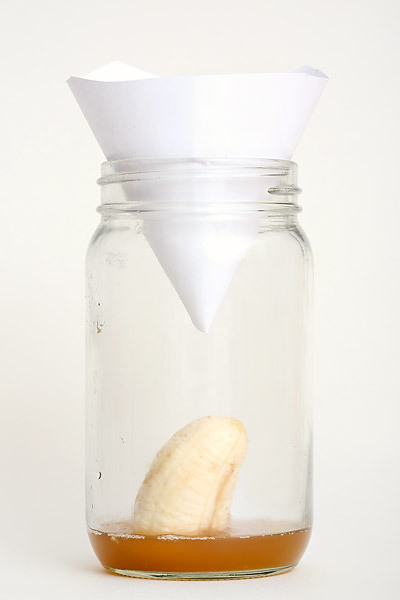 Now is the time to build a simple, all natural, and wonderfully effective fruit fly trap. That’s it! The flies will smell the ripe fruit, fly into the funnel and be unable to find their way out. They will end up drowning in the vinegar. Every few days you can dump the contents of the jar down the drain, and start again with a fresh vinegar bath. This trap works really well! 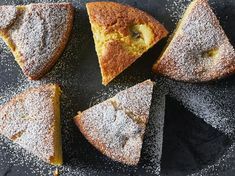 You might always have a stray fruit fly around your kitchen, but the swarm should be contained. I’m always amazed by how many are in the bottom of the jar after a couple of days! Where do these things come from…? A couple of tips and tricks I’ve learned along the way: 1) Be sure to empty and rinse out the jar every two or three days. If you wait too long the flies will glue fly eggs to the side walls of the jar, and they are impossible to scrub off. 2) You must use apple cider vinegar – white vinegar does not work here. Malt and red wine vinegar work, but not as good as the apple cider vinegar. 3) If your paper cone is not fitting quite right, moisten your hands with water, then carefully manipulate and press fit the now damp cone into the mouth of the jar. And don’t worry if it’s not a perfect fit – the trap will still get a lot of flies. What are your tricks for combating the summer fruit fly invasion? This entry was posted in DIY Green Ideas, In the Kitchen, The Power of Vinegar and tagged better for the earth, better for you, easy, homemade, kitchen, reuse, saves time, vinegar. Bookmark the permalink. 23 Responses to Making Your Own Fruit Fly Trap Review – Does It Work? I hadn’t heard of using vinegar and fruit. I might give that a try sometime. I haven’t had a problem with fruit flys for a while, but when I did I left out a small bowl of dish soap and red wine on my counter. I was amazing how many fruit flys were caught in it. It also had to be cleaned out after a couple days but was very, very effective. Thanks for the tip, Kate! What a simple, but wonderful tip. Just about to make the flytrap with my daughter now. I am new to this magazine and i’m loving it ! do you have any tricks to combat regular ol’ nasty houseflies?? I am so gonna do this fruit fly thing!!! THANKS!!!!! I haven’t done houseflies yet, as they aren’t a bit problem where I live in Southern California. Definitely something to put on my list, though! they are HORRIBLE in the south!! and you are lucky! fruitflies are cute compared to houseflies…count your blessings!! and please find all of us southerners a remedy!!!! love this site!! Thanks for your kinds words Beth! I’ll think on a housefly trap, but I may need some southern helpers to test it out! I will be glad to test it out and can get other volunteers if needed!!! Thanks Beth, I’ll let you know if I think something up! I had wanted to do this but couldn’t get the paper to fit quiet right. I just put a piece of banana in a jar, covered almost completely with plain tap water & added a few drops of dish soap. I did not use any vinegar (didn’t have any on hand and was desperate to try anythin to get rid of the swarm). Within two days ALL the fruit flies were gone! This will definitely be my go to way of getting rid of these pesky pests. I’ve found that even if the paper cone doesn’t fit quite right, the trap is still super effective. Did this last year and worked like a charm. Took a bowl, added balsmic vinegar(cause that’s what I had) put in a piece of banana peel and then covered it tightly with saran wrap. Poked a bunch of holes in the top with a fat needle and then waited. OMG did it work. They were flying around in there like crazy. I am going to do it this year with the drop of dish detergent to make sure they expire. Love your site. Get alot of good ideas from you. Ooooh – saran wrap could work well too! Thanks for sharing, and for your kind words, Chris! When there is no paper/lid I find that the first day you’ll find several fruit flies congregating around the top, but then just give it overnight and there will be several drowned in the bottom. I did this one night while having a party all of a sudden we were bombarded with fruit flies. Someone made this and we set it out. It worked great! I do it whenever I see a few fruit flies and it is like magic. I just use cider vinegar, no soap or fruit and it works really fast.